Speculation about the 2012 Republican nomination is already underway and, as always, national "horse race" poll questions are central to that conversation. While we will certainly track those polls on HuffPost Pollster, anyone hoping to make sense of the battle for the Republican nomination should be forewarned: Over the course of the next year, such polling for national primaries will have little value in predicting the ultimate winner. 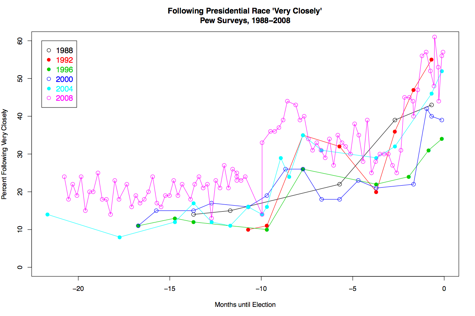 Let's consider the dynamics of the presidential primary campaign. Since the 1988 dawn of "Super Tuesday" -- a single day in February or March when a huge number of states hold primaries or caucuses -- the presidential nomination process has had three distinct phases: An early period before the Iowa caucuses, the weeks of early state primaries between Iowa and Super Tuesday, and the months between Super Tuesday and the conventions. In the first phase, presidential candidates raise money, hire staff and build early state-level field organizations. As Jonathan Bernstein said last week, this phase is is mostly about a process in which "activists and politicians, campaign professionals and interest group leaders, members of the partisan press and governing professionals, and even officials and staff of formal party organizations, local and national, coordinate and compete over the various candidates and over the policies those candidates commit to." However, as Bernstein also noted, "ordinary voters" don't get involved in the process "as voters" until the Iowa caucuses kick off the second phase. And even then, with the possible exception of the New Hampshire primary, the turnout among eligible voters remains low, at least as compared to the fall election. In 2008, for example, more than half of eligible voters (53%) cast ballots in the New Hampshire primary, but only 16 percent participated in the Iowa caucuses, only 20 percent in Michigan, 10 percent in Nevada, 30 percent in South Carolina. While the absolute number of participants in phase two is relatively small, these early primaries and caucuses get heavy national news coverage that significantly increases the level attention paid by ordinary Americans. Consider the chart below, created and updated by our colleague Charles Franklin, which shows the percentage of Americans who told the Pew Research Center they were paying "very close attention" to the presidential campaign in surveys conducted since 1988. Typically, the remaining primaries and caucuses held during the third phase effectively ratify the choices of voters made during the second. The third phase of the epic 2008 Democratic contest, which remained close until the very end, was something of an exception, but voter preferences for either Barack Obama or Hillary Clinton largely persisted throughout. The key point here is that during the first phase, national horse race poll questions are of dubious value. Until the Iowa caucuses, the vast majority of primary voters nationwide are not paying attention to the campaign and will be largely unfamiliar with the announced or potential candidates. The candidate preferences that voters share with pollsters are extremely tenuous -- they will typically grasp for familiar names -- and can be highly unreliable in predicting the nominee. Just ask presidents Hillary Clinton, Rudy Giuliani, Mario Cuomo or Edmund Muskie. Horse race poll questions start to matter more in the second phase of nomination campaigns, as the field of candidates narrows and as previously little-known early primary winners rocket up in the rankings. Once the second phase is complete, primary voters have usually form preferences that persist with relatively little variation through the convention. But again, we pay far too much attention to national horse race polls in the first phase. In the books that chronicle the 2008 race, the players that look most foolish in retrospect are those that asked endlessly during 2007 why Barack Obama's campaign was failing to "move" in the national polls. Our trend estimate of Obama's support in national polls for that period hovered just below 25 percent, and Hillary Clinton's support appeared to grow over the summer. But between the Iowa and Super Tuesday in early 2008, those preferences turned upside-down. 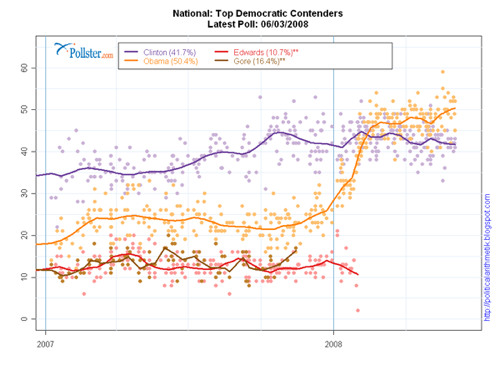 Obama's campaign team deserves immense credit for ignoring the national polls during 2007 and focusing their resources on the early primaries. So if the national horse race polls are of dubious value, what national polls on the Republican presidential battle do merit our attention? First and foremost, we should watch the questions that ask about each candidate separately. These may not tell us who will win, but they will tell us something about where each candidate starts in terms of name recognition and -- for those that are better known like Palin, Huckabee, Romney or Gingrich -- about the more specific perceptions that voters have already formed. More on these questions in a future post. If there were a dominant front-runner in the Republican field, like Sen. Bob Dole in 1996 or Vice President Al Gore among Democrats in 2000, early horse race questions might have greater value. 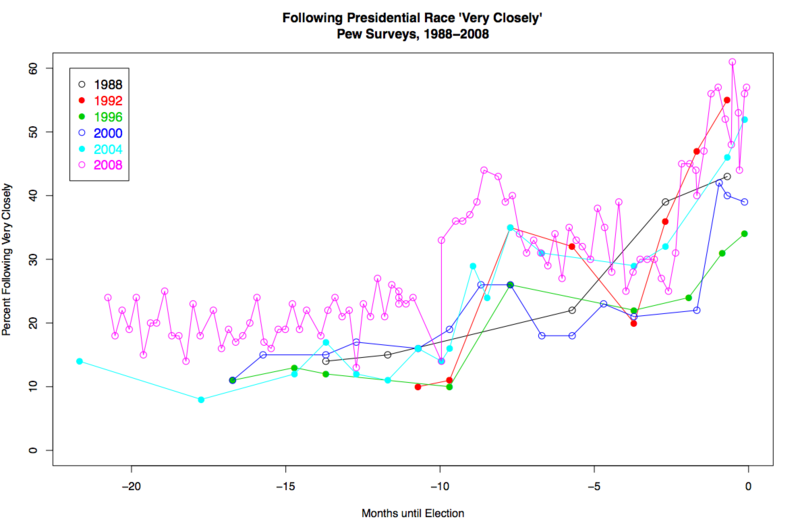 But if you just want to know who will win the Republican nomination in 2012, the early horse race numbers are telling us very little.